The Genea-Blogger Picnic is being hosted by Bill over at West in New England. A tisket, a tasket, a green and yellow basket... okay, it wasn't a green and yellow basket that we brought with us when we went on picnics. It was our light blue, metal, Coleman ice chest and it weighed a ton. 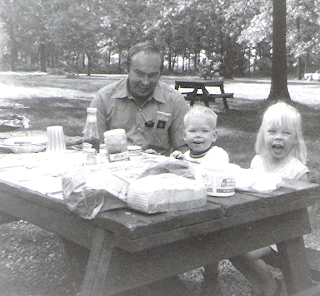 My mom was a big fan of picnics. I think that they are alright. Summer here in south western Ontario can get really hot and muggy - not good picnicking weather. Anyway, here is how picnics have fit into our family. Lake, Gene, David & Kathy at Ojibway Park. Photograph. June 1970. Digital Image. Privately held by Kathryn Lake Hogan UE, [ADDRESS FOR PRIVATE USE,] Windsor, Ontario. 2008. Point Pelee National Park was one of our favourite spots to picnic. We would always spend the whole day there. We would wake up on a Saturday morning and my mom would say "Let's go for a picnic at the beach today." My brother and I would be excited. A flurry of activity would take place for the next hour as we would all rush around trying to get ready. Once at Point Pelee we would head to West Beach. Once we found a place to park, we would then unpack the car, walk across the hot boardwalk and then the burning hot sand to find a place to set up. Once we dumped the stuff on the table, my brother and I would run like crazy across the fiery, hot sand and pebbles to the water's edge. After swimming for about an hour or so, Mom would call us back up on shore to have our picnic lunch. Nothing like eating a sandwich while you are dripping wet from Lake Erie. Mix in a little sand and add a few flies. The day would also include a trip to the Visitor's Centre, a shuttle ride to the Point, and of course, a walk on the boardwalk at the Marsh. After a sun drenched day, we would head home, tired, sometimes sunburned, but very happy. Some of our other favourite picnic places included Ojibway and Mic Mac parks. As we got older and busier, we would sometimes picnic at Reaume Park/Coventry Gardens. We would grab a bucket of chicken from Kentucky Fried Chicken and my mom would decide we should eat it outside at the park. By this time I was a teenager. I hated to go on picnics. The heat. The humidity. The flies. And of my goodness, what if someone saw me?!! And so, our picnicking days started coming to an end. Now that I have kids, we sometimes go on picnics. In fact, this Genea-bloggers picnic has inspired me. I think we will be going on a picnic to Point Pelee before the summer is over.